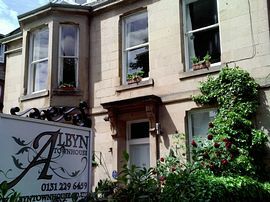 The Albyn Townhouse is an impressive four storey 19th century Victorian House. Formerly the St Oswald Church Manse, our family run, 4 star guest house has ten fully en-suite bedrooms, offering doubles, twins or family rooms for up to four people. All our rooms are spacious and tastefully decorated and offer flat screen TV, tea and coffee facilities, hair dryer and central heating. We are located off Bruntsfield Place and a minute away from Bruntsfied park, in a quiet and beautiful tree line cul-de-sac, within walking distance from the Old town and Edinburgh Castle, as well as restaurants and shops and Edinburgh's major attractions. We also offer three private car parking spaces...to be booked in advance only! 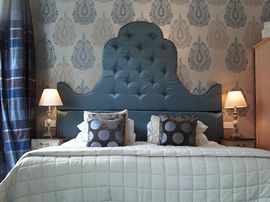 The Albyn is perfect if you are looking for tranquillity and welcoming surroundings as well as a city centre feel. 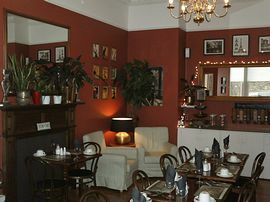 Prices include a full Scottish or continental breakfast. We love our house and we will make sure you have a unique experience and love it too, we take great care in making sure that you are as comfortable as we would like to be and this means a good night's sleep!! 3 free car parking spaces. Calm and quiet surrounded by trees in the city! St. Andrew Square bus station & both Edinburgh Waverley and Haymarket train stations are very close to the House. A taxi to the hotel is around £7.00. Around the corner from us, buses 11 & 16 will take you to Princes Street and 23 will take you to the old town, £1.00 per single or £2.50 for a day ticket. There is a bus that runs between airport and the city centre approximately every 15 minutes. The fare is about £3.60 one-way or about £6.60 return, the stop is in Princes Street/ Lothian Road & a taxi from there would be about £5.00. It is walkable, but I wouldn't usually recommend it if your bags are heavy or if you are unsure of the location of the guest house. Alternatively, a taxi would cost from £18.00 - £22.00 from the airport direct to the Townhouse. From the North: (Forth Road Bridge) M90/A90 Continue on A90 to Edinburgh and then follow A90 / Queensferry Road to city centre (Charlotte Square). Follow signs for A702 to Lothian Road and continue on Lothian Road to 5th set of traffic lights (Tollcross clock). Turn right onto Home Street (still A702 direction), take a right at the SCOTMID grocery store into Viewforth, then Hartington Gardens is second left after about 300 yards and the Albyn Townhouse is the last house in the street the only one with a car park. From the West (M8/M9) Follow motorway signs to take the exit for the city bypass which is signposted as A720 south. Exit at Lothianburn junction onto the A702 (Comiston Road city). Continue on A702 / Comiston Road into the city for approximately 3 miles. You will pass through shopping district Morningside. Continue on Morningside Road to Bruntsfield Place. Take a left before the SCOTMID grocery store into Viewforth, then Hartington Gardens is second left after about 300 yards and the Albyn Townhouse is the last house in the street the only one with a car park. From the South and East: (A1, A68 and A7) Follow signs onto the city bypass (A720). Exit at Lothianburn junction onto the A702 (Comiston Road to city). Continue on A702 / Comiston Road into the city for approximately 3 miles. You will pass through shopping district of Morningside. Continue on Morningside Road to Bruntsfield Place. Take a left before the SCOTMID grocery store into Viewforth, then Hartington Gardens is second left after about 300 yards and the Albyn Townhouse is the last house in the street the only one with a car park. November to March: £35.00 per person per night. 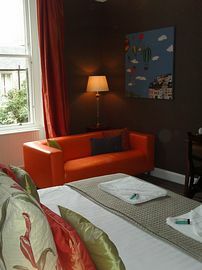 April to October :	£40.00 per person per night. 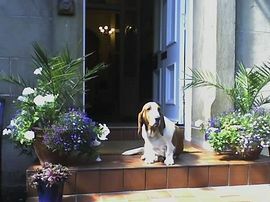 July and August:	£49.00 per person per night. New Year:	£50.00 per person per night. Check-ins up to 8.00pm, late arrival by arrangement. Left luggage by arrangement on arrival and departure if needed.